The Cohoes Falls this past Saturday. John Lipscombe, director of the water quality program for the conservation group Riverkeeper, said the reddish color came from suspended sediment from upstate rivers. Mr. Lipscombe said he watched several rivers wash into the Hudson the day after the storm hit. "They were torrents, and they were red," he said. He added: "The reddish clay is part of the geology of the Catskill area, and when that kind of rain causes a scouring of the river banks, an enormous amount of red clay and other dirt washes into the Hudson. This has happened before but it was pretty dramatic this time." 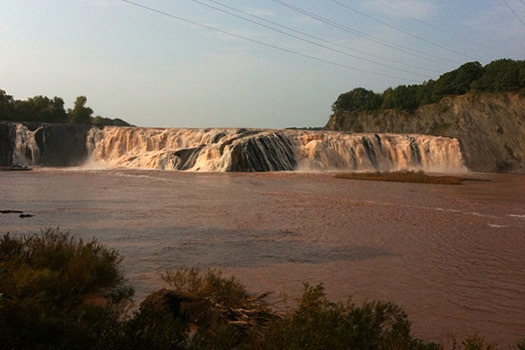 This past weekend the Cohoes Falls (above) looked like they were running with chocolate (the smell was something rather less appetizing, along the lines of dead fish and backed-up sewer). And when we were in Windham a few days after Irene, the Batavia Kill was running a deep red/brown -- the mud left behind had turned into a reddish dust that stuck to seemingly everything. This has apparently been an issue of concern for New Yorkers. Twitter is full of people remarking on the color. Speculation: the Hudson has an STD, Irene took a dump in the river, possible apocalypse. 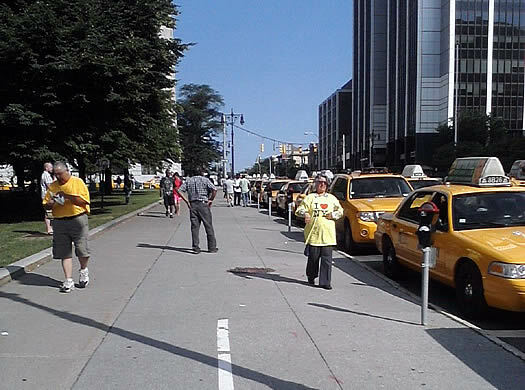 NYC taxis have invaded downtown Albany! Apparently they're in town for some sort of protest, but it was strange sight. The photos (attached) doesn't do it justice. There was a mass taxi sighting at the Exit 24 tolls this morning, too. More photos via Summer after the jump. Update: Sean reports that many of the taxis were ticketed. 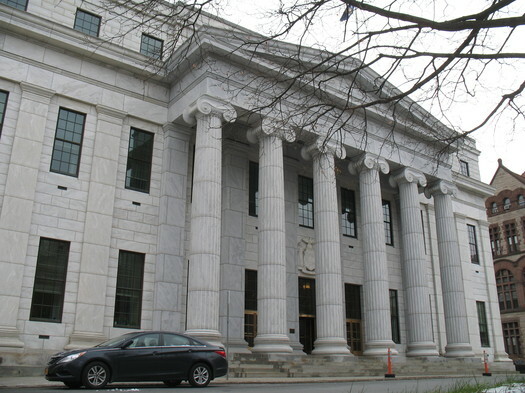 Albany-NYC: strong potential for high-speed rail? 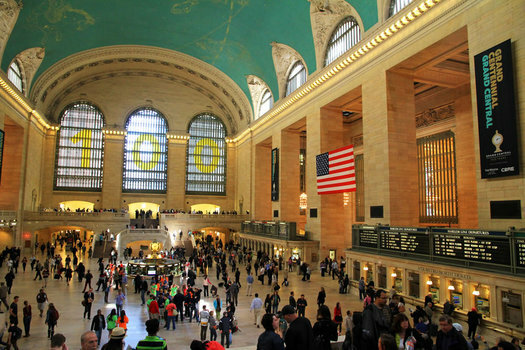 New York City to Albany ranks as one of the corridors with the most potential for high-speed rail, according to a report from a planning/policy org called America 2050. The report assigned scores to almost 8000 rail corridors (of less than 600 miles) across the country based on group of factors including population, employment, and transit ridership. 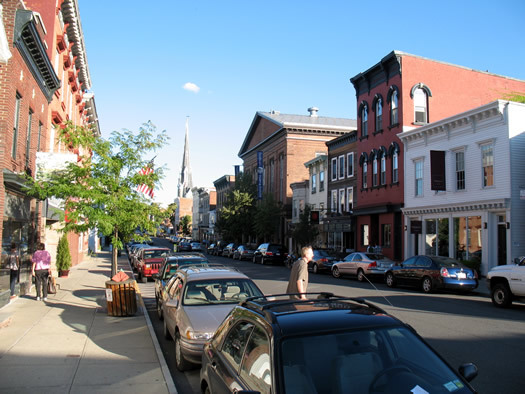 The NYC-Albany corridor ranked in the top one percent of all routes in the nation. For some comparison, Washington DC-NYC was the top ranked route with a score of 20.15. 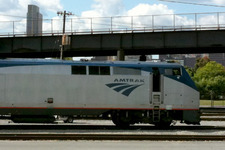 The NYC-Albany route scored 19.29. The report includes some really delicious transit nerding. 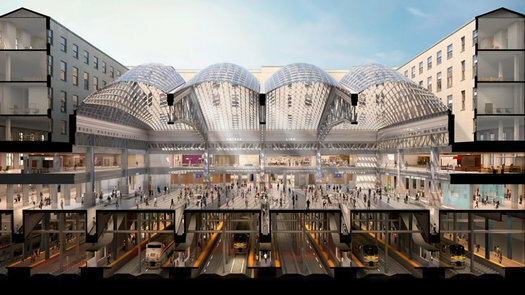 Transportation Nation has a further breakdown of the results, including some thoughts on the effect of national politics (and circumstance) on current high-speed rail projects (or, how Florida could end up with the nation's first high-speed rail corridor [or not]). As we understand the way these scores were calculated, corridors with already strong ridership tend to score best. So it's not surprising that NYC-Albany scored well -- the Empire Service is the fifth most-traveled route in the entire Amtrak system. 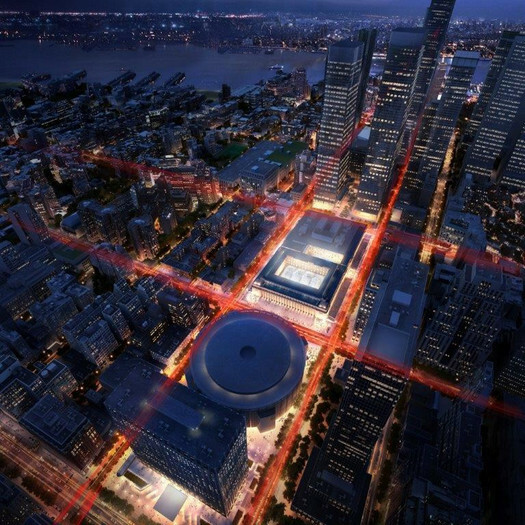 So, what could high-speed rail mean for Albany? Well, it could open the possibility of getting from Albany to Manhattan in about an hour (potentially). That's a commute for some people. 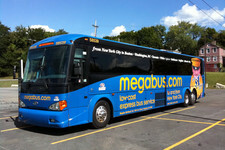 NY City Bus -- competition for the MegaBus? A new bus service between Albany and NYC started up today. The aptly-named NY City Bus is selling one-way rides to/from the city for $10. We had never heard of NY City Bus until recently, so we did a little bit of poking around -- and it looks like the bus line has a lot of similarities to the DragonDeluxe line. There are so many similarities that we wonder if it's connected to the Dragon. It shares the same pick-up (91 Colvin Avenue and 102 Central Ave in Albany) and drop-off (26 Canal Street and near Port Authority Bus Terminal in Manhattan). And the two services seem to use one of the same operators (All State). 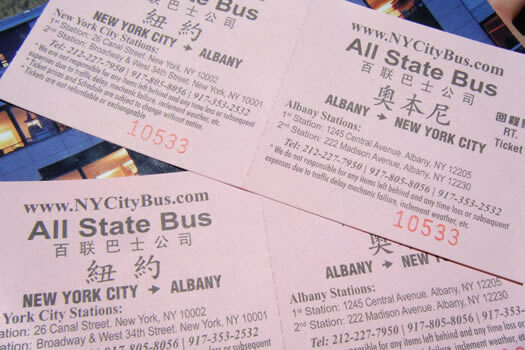 The NY City Bus corporation was registered this past March and the listed address in Chinatown in Manhattan is different from that of the company that runs Dragon Deluxe, according to the listing on file with the state. The Dragon Deluxe fare is roundtrip fare is more expensive -- $40 vs. $20. The NY City Bus site doesn't list the $20 fare as a promotion or sale or anything like that. The NY City Bus lists a handful of routes around the country. Has anyone ridden it before? Anyone have the scoop? Earlier on AOA: We broke down the travel options between Albany and NYC by price, time and ease.